This winter season, shower yourself and your loved ones in holiday bliss with Bohemia. 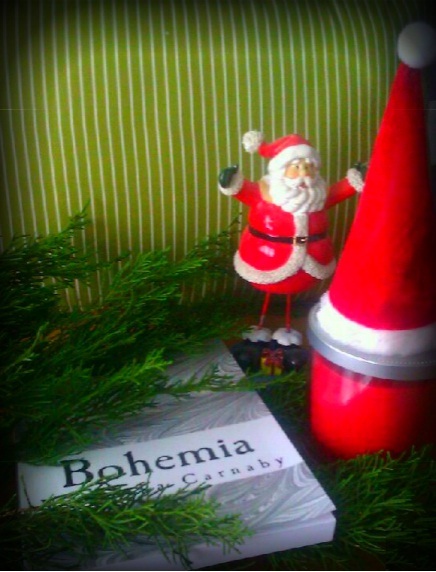 Order Veronika Carnaby's hit debut novel as a gift through Amazon today to have it specially wrapped in high quality "coordinating papers, boxes, bags and ribbon" and ready to place underneath the Christmas tree, inside a stocking, or in a good friend's grasp. In addition, customers have the option to attach a free personal gift note. Order at your local Amazon site and treat yourself to the ultimate holiday gift that has garnered rave reviews and international attention from readers and critics alike. Click HERE for more information on Amazon's gift-wrapping services. Don't miss out on Carnaby's thrilling new read for the modern beatnik, in which she provides a wild, unrestrained account of '60s counterculture youth bursting out of their creative shells. Influenced by the works of Beat writers and poets, the story takes place during 1960 and chronicles a group of bohemian twenty-somethings who defy the "ideals" of a mid-twentieth century society to seek creative fulfillment. More than anything, the author's spontaneous narrative and equally as impulsive characters brilliantly reflect the rebellious nature of art. The book includes a cover quote from notable jazz musician and composer, Archie Shepp.